By Raniere Silva, Community Officer, Software Sustainability Institute, and Shoaib Sufi, Community Lead, Software Sustainability Institute. As part of the third phase of The Software Sustainability Institute, the team at the University of Manchester is searching for one new full-time staff member to join our "Better Software Better Research" campaign in the capacity of Research Software Community Officer or Research Software Community Manager. Although the role is described in the job advert, this blog provides additional context. The Institute has conducted community activities since its start in 2010. The recruit will be working closely with the Institute’s Community Lead to help understand, support and promote Communities of Practices around research software. Main activities include managing a network of Institute Fellows, organising workshops, engaging with the doctoral training centres, writing up case studies, promoting the research software needs inside and outside the Institute, and supporting research within the research software community itself. More specific details and skill requirements are in the job advert. During the Institute's second phase, we increased our Fellows network to 113 members. We are now looking for someone who will continue the work with the Fellows network and collaborate with our current Fellows to identify and develop communities of practice in the research software space. As part of the development of communities of practice, we will write and publish best practices (e.g. Ten simple rules for measuring the impact of workshops) and promote new career paths (e.g. Research Software Engineers). Part of this work will be done in collaboration with an array of open source communities, e.g. The Carpentries, R User Group, R-Ladies, rOpenSci, Jupyter, Julia. Collaborations Workshop (CW) is the Software Sustainability Institute's annual event that brings together researchers, software developers, managers, funders and more to explore important ideas in software and research and to plant the seeds of interdisciplinary collaborations. Our new Community Officer/Manager will be responsible for supporting (Officer) or leading (Manager) the conceptualisation, organisation and running of this series, ensuring that it continue to be the place where we start changing the world–the Research Software Engineer movement was conceptualised during Collaborations Workshop 2012. The recruit will be based at the eScience Lab team in the School of Computer Science at the University of Manchester. 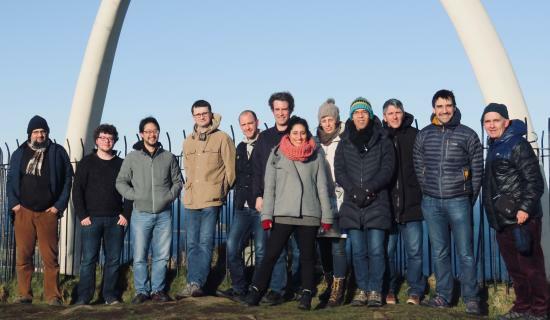 The eScience Lab team is a microcosm of the research software community (coders, scientists, manager, investigators) with interesting people to talk to, which can be a great sounding board for ideas. In addition to the eScience Lab, the University of Manchester is a truly global institution, with a reputation for education and innovation that resonates across the world. The University provides the spark for positive change in many different levels: from leading the European renaissance in industrial biotechnology to helping to train midwives in developing countries. The positive change list also includes a Research Software Engineer group. Additionally, Manchester was the 2016 European City of Science and hosted many events related with the Institute motto, "Better Software Better Research", such as the EuroScience Open Forum and the first ever RSE Conference. Do you understand how scientific research is conducted and software’s place in it? As a bonus, do you understand the open science landscape? Do you want to work to make it better? Some of the personal qualities that would make you ideal for the role are being a great listener, having the desire to help others, having good judgement, empathy and enjoy working in interdisciplinary teams. Perhaps you’re a researcher who’s used or developed computational methods and would now like to work more with community building in research. This job could be the perfect opportunity to gain or expand your people and project management skills. If you’re interested in applying for the position, then check out the job advert which provides a description of the role, how to apply and contact details for any questions. The closing date for applications is Sunday 14th April at 5pm (GMT+1) 2019. We welcome UK and international applications. 10-20% of the post will require travelling: nationally, Europe-wide and on occasion internationally. Any questions please get in touch with the Institute’s Community Lead.